Hyundai Motor UK has announced UK pricing for NEXO, the company’s second generation hydrogen fuel cell electric vehicle which is available to order directly from Hyundai Motor UK from today. 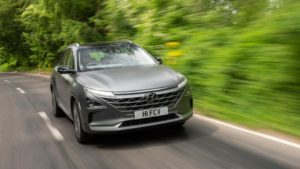 NEXO has a claimed range of up to 414 miles and it joins Kona Electric and IONIQ Electric as the latest electrified Hyundai model available in the UK and one of the 44 new electrified models that Hyundai Motor Group pledge to launch by 2025. Available in one high trim specification, the £65,995 Premium SE, NEXO is a bespoke SUV with a frontal design that incorporates the Hyundai cascading grille and which further includes a full width LED positioning lamp, composite LED headlamps and combined LED daytime running lamp and indicators. At the side, 19-inch alloy wheels, gloss black door mirror housings and a silver garnish on the lower doors continue the design, which is finalised at the rear with a high level gloss black spoiler and LED combination lamps. The exterior of NEXO is also designed to minimise drag, with curtain intakes in the front bumper ducting air over the aerodynamically designed front wheels, flush door handles that retract into the doors at 3km/h (2 mph), air tunnels around the D pillar that channel disruptive air flow around the tailgate area and a hidden rear wiper blade that retracts underneath the rear spoiler when not in use. Underneath, a fully enclosed underside and front and rear wheel air deflectors complete the aero work, allowing NEXO’s full size SUV body to achieve a drag coefficient of just 0.329. The interior of NEXO features a Greige two tone interior trim incorporating cloth and faux leather seats, with the heated and ventilated front seats featuring full electrical adjustment, whilst the rear outermost seats offering independent heating. Dual zone climate control, sunroof, rear centre console ventilation, heated steering wheel, USB and QI wireless charging points and smart electric tailgate are some of the specification highlights. Situated within the drivers eye line is NEXO’s 7-inch LCD supervision instrument cluster, providing important driving information such as speed, fuel, temperature, power and odometer gauges. The supervision cluster also houses NEXO’s Blind Spot View Monitor, providing an on screen display fed from NEXO’s door mirror mounted cameras when the indicators a used and providing a real time display of the driver’s blind spot areas, enhancing rearward visibility in dark or adverse weather conditions. Responding to feedback from ix35 Fuel Cell customers, NEXO can also provide real time vehicle condition information, including energy flow and hydrogen tank operating conditions as well as air purification and CO2 reduction levels that NEXO achieves in normal driving conditions. NEXO’s fuel cell electric powertrain offers increased performance over its ix35 Fuel Cell predecessor, with a system output of 120kW/161 bhp and 291 ft lb torque yet still delivering a WLTP range of 414 miles based on the combined cycle. The under bonnet Power Module Complete (PMC) combines oxygen from the surrounding air and hydrogen from NEXO’s high pressure storage tanks, creating a flow of electrons that both powers the drive motor and charges the on board 1.56kWh high voltage battery. The only emissions from this process being harmless water vapour. 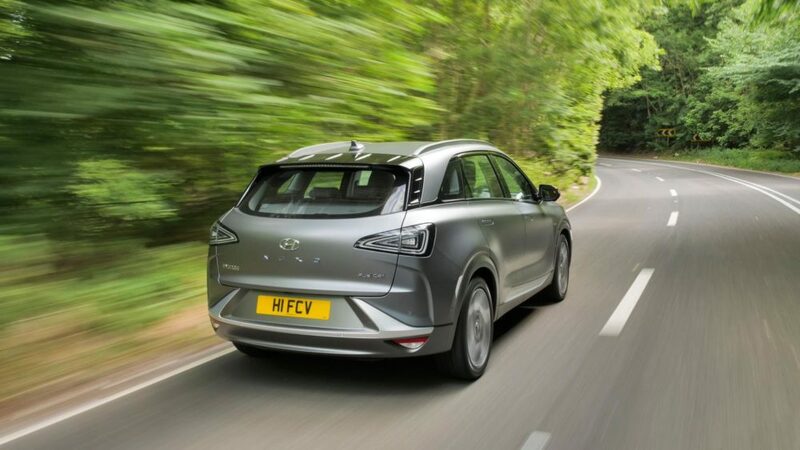 NEXO uses adjustable regenerative braking, controlled by steering wheel mounted paddles, to both provide additional charge to the high voltage battery and provide a more engaging driving experience and has an advanced air purification system which filters 99.9 per cent of very fine dust (PM2.5). The vehicle shows the exact amount of air purified on the display panel in the car. NEXO is available directly from Hyundai Motor UK.